On my Dresser, originally uploaded by Temeculamom. 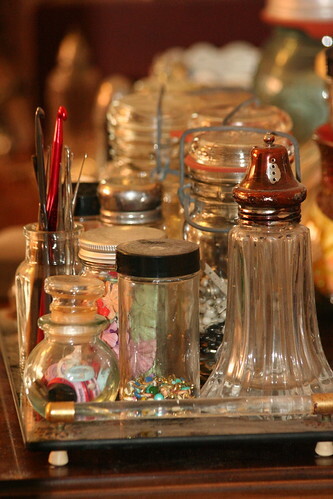 Just a few of the many jars full of goodies that are fast overtaking my room. This doesn’t include the boxes of stuff under my scrapping table. I need to refinish a big bookcase that’s pining in the garage, because my hubby hates it. I have dreams of it in my room, with all my crafting supplies on board. It’s super tall and got two shelves with doors beneath and four above, not to mention the top. ~ by bekaboo on March 22, 2007. I have no idea about furniture painting or other painting for that matter… but your shelves will look fantastic once you’re done. I can’t wait to see pics. Love the look of all your different jars and bottles Beka. Especially that silver topped pepper shaker. I love all your little containers. My husband hates things that take up space like that, as his mother hated that kind of stuff too.. but peeeeshaw on that. I adore trinket boxes, bottles, tins – the warm my heart and put a smile on my face. I loved these pics! !